Chris Jolly's private and exclusive property ranges over 20,000 acres of Southern Wairarapa coastal hill country, which is located on the east coast of the North Island of New Zealand. You will fly into Wellington, New Zealand and will be met by Chris or Simon and transferred to the station. Here you will encounter a wide variety of terrain and hunting conditions, large native Podocarp forest, scrublands (reverted pasture) and open grass pastures make for a perfect environment for both the deer and the hunter. 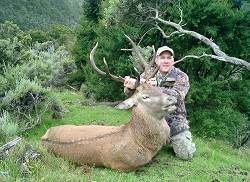 about our Chris Jolly Wairarapa Hunt - North Island Red Stag package. After the Roar the stags tend to drift out of the forest and feed on the adjacent grasses, recouping after the rigors of the mating season. This type of hunting is more about the use of binoculars and long range shooting and often produces the biggest stags. A good fitness level is required. We are targeting 10-14 point animals that may be up to 40 inches. We do NOT charge trophy fees for each animal shot so there is always a chance to take a second bigger stag during your stay. Currently the only trophy fees are for Fallow Deer stags at $1,000 USD. Accommodation is in a comfortable, purpose built lodge/camp. Read more about and see photos of Te Awaiti, Chris Jolly's private hunting lodge. On most occasions you will have the camp to yourselves as they only take a maximum of 4 hunters. Fully carpeted floors, comfortable beds, warm fires and great cooking make for a welcome retreat from the vigors of a day of hunting. With seven miles of private coastline, caryfish and abalone (paua) often supplement venison, wild pork and wild mutton on the menu. The Red Deer Stags, often to fourteen points are our main quarry but you can discuss with Chris your particular hopes/aspirations. Often we need to cull inferior stags and excess hinds are we are happy to arrange non-trophy type meat hunts. We also encounter wild pigs and fallow deer, although the fallow herd is in its infancy. See our photo gallery for Chris Jolly's hunts. The hunting season, starts in mid to late March. The roar takes place approximately from late March until late April. We continue to trophy hunt until August at which point the large stags are near to casting their antlers. Non-trophy hunts can be done (by arrangement) year round. This is one of the most popular camps for 2009 and will sell out again for 2010. Download our flyer for Chris Jolly's hunts.